Are you a last-minute card-buyer? You know, the one who is madly dashing to Target on the way to an event because you forgot to get a card? How great would it be to have a stash of ready-made cards on-hand and save yourself the stress of late-night shopping trips? Have I got a solution for you! Using this tutorial create up to 48 handmade cards and never go cardless again. 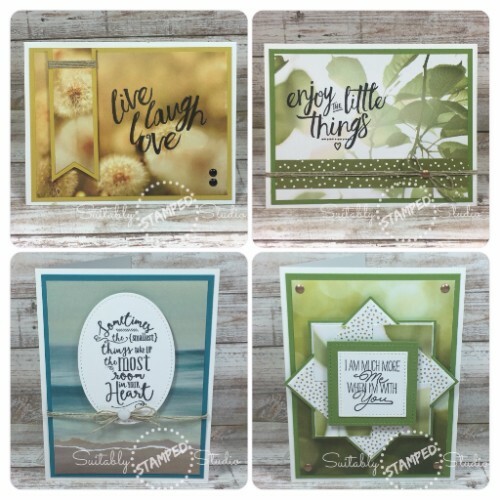 Here is how it works: Order the following products from my online store and I will send you a color, step-by-step tutorial for each of the four card designs shown above. These cards are quick and easy to put together, so you’ll have your stash built up in a couple of hours.